Northern Ireland’s Causeway Coastal Route was recently named as one of the best road trips in the world and with very good reason. It’s an absolutely stunning stretch of coastline that stretches from Belfast to Derry, with loads to see and do along the way. From epic scenery to ancient castles and million-year-old rock formations, you’re sure to be blown away around every corner. 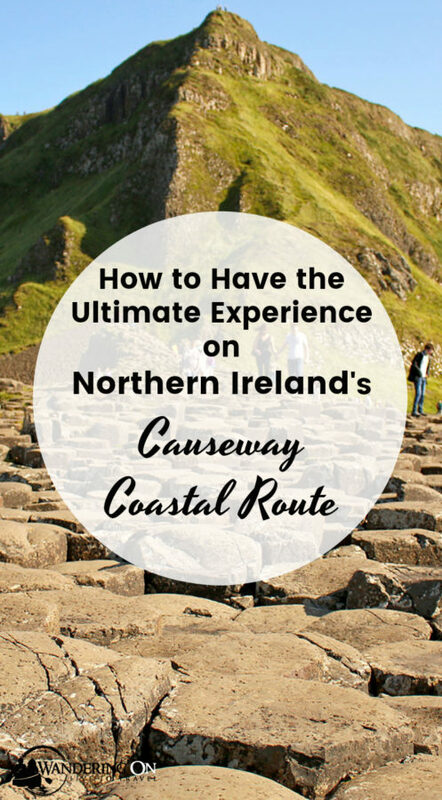 You can choose to drive the Causeway Coastal Route, take the train all the way from Belfast, or even from Dublin, or traverse this section of the Antrim coast on foot. There’s even the possibility to link up with the Wild Atlantic Way if you can’t get enough of road tripping in Ireland. 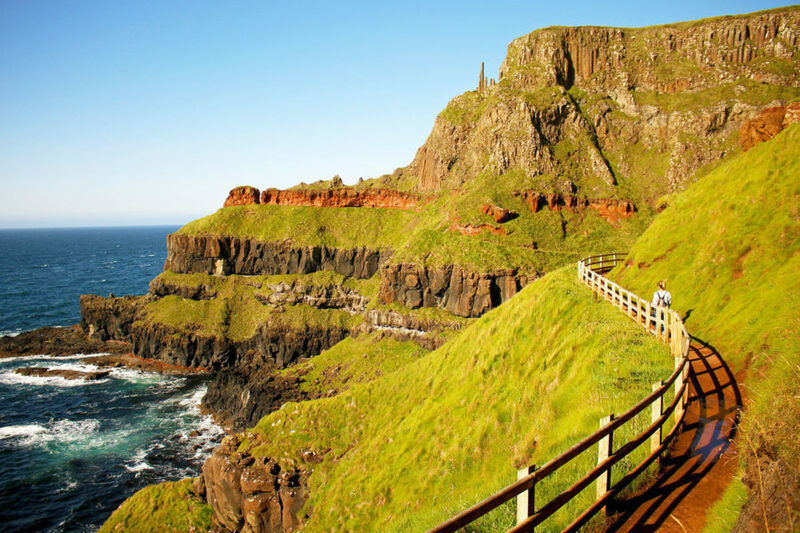 Listed among the top things to do in Northern Ireland and one of the top regions to visit in 2018, the Causeway Coast will not disappoint. 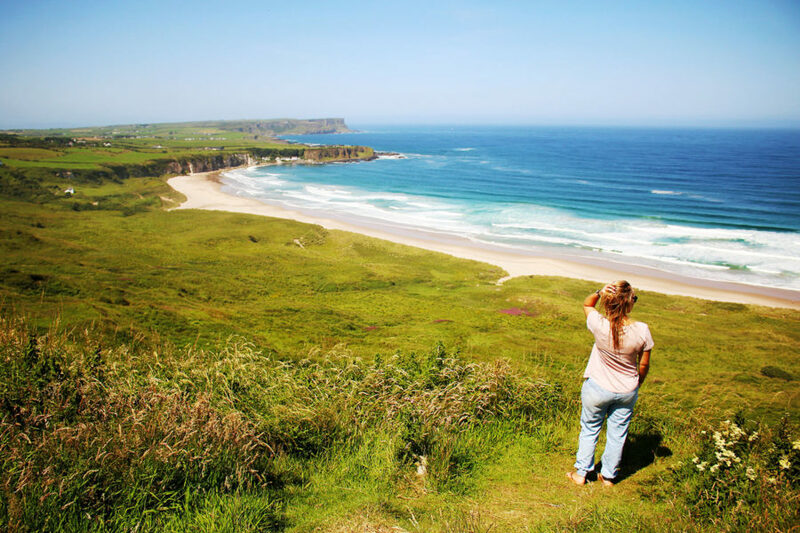 Here are our highlights and absolute must-sees to add to any Causeway Coastal Route itinerary when touring this spectacular stretch of the north Antrim coast. One of the main highlights of the Causeway Coastal Route is its namesake, the Giant’s Causeway, which is Northern Ireland’s first and only UNESCO World Heritage Site. 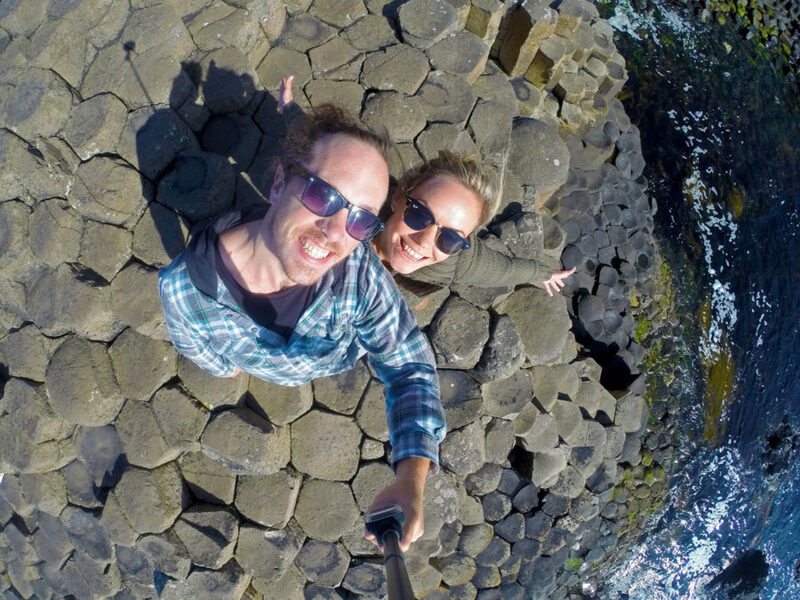 It’s not only one of the top places to visit in Northern Ireland but it’s also among the top natural sites in the world as it shares its World Heritage status with places such as Nepal’s Sagarmatha National Park and New Zealand’s Fiordland National Park. The area is shrouded in folklore, legends and a little bit of magic. 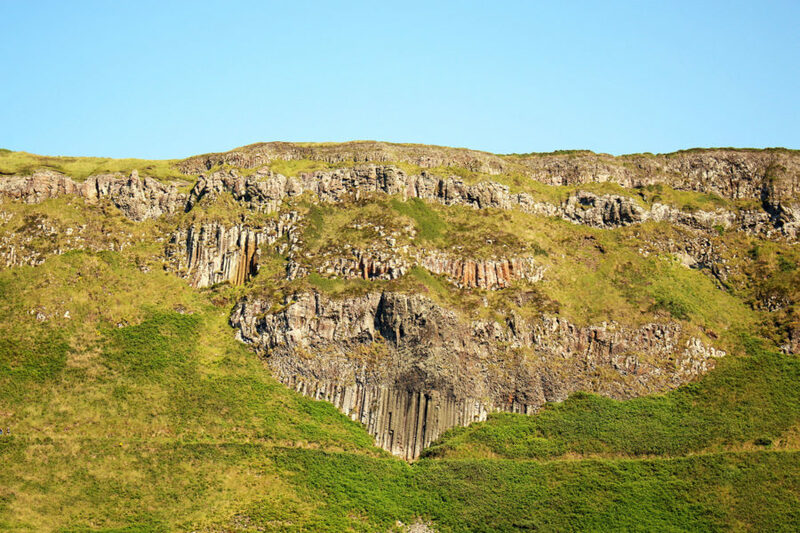 Perhaps some of the world’s most famous rocks, the 40,000 hexagonal stone columns were formed by volcanic eruptions 60 million years ago or by the mighty giant Finn McCool (Fionn MacCumhaill as Gaeilge) as a bridge to cross over to Scotland – you decide. Noelle looking out to see if the chimneys are smoking, meaning that the legendary giant Finn McCool is home! The National Trust has done an incredible job with the state-of-the-art Giant’s Causeway Visitor Centre which completely blends in with the natural surroundings at first glance. The energy-efficient, sustainably designed building complete with a grass roof offers 360-degree views of the Causeway coastline as well as interactive spaces where the science and legends behind the area truly come to life. There’s a chance for a Giant’s Causeway tour with an optional guided walk, which is included in the visitor experience admission charge. 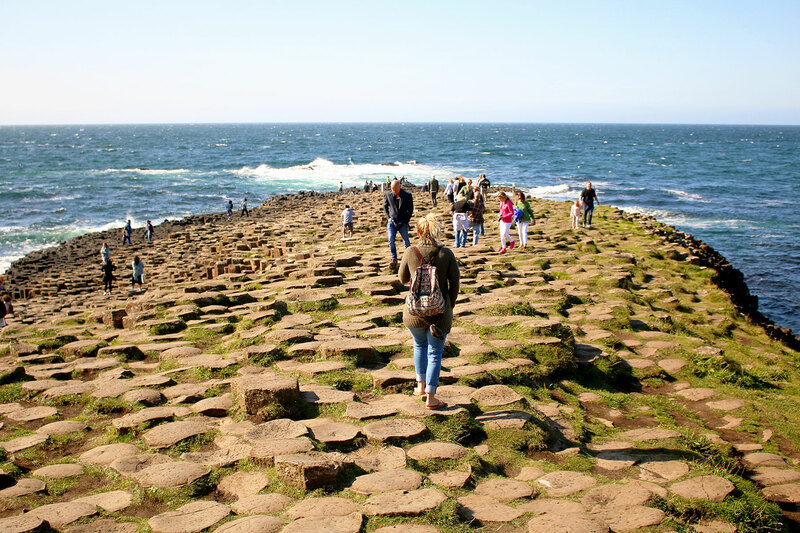 This is very informative and your guide will share all the myths surrounding the causeway as well as point out some of the distinctive rock formations such as the ‘Wishing Chair’ and ‘The Organ’. Guided tours take about an hour. 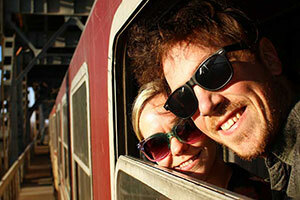 There’s also the option of various self-guided audio guide tours available in eleven languages. Here is one case where you definitely want to exit through the gift shop! The award-winning gift shop in the visitor centre is the National Trust’s most successful retail outlet, with sales helping them to carry out essential conservation work on 22 percent of Northern Ireland’s coastline. It is a really unique gift shop in that eighty percent of the items on sale are locally produced crafts, gifts, food products and souvenirs, nothing is mass produced so it’s great to see local producers being supported. The artists and artisans who supply the gift shop are based all over Northern Ireland and everything from ceramics to t-shirts, handcrafted jewellery, and photographic prints are available. You’re sure to find something special to remember your visit to the Giant’s Causeway and the North Antrim Coast. 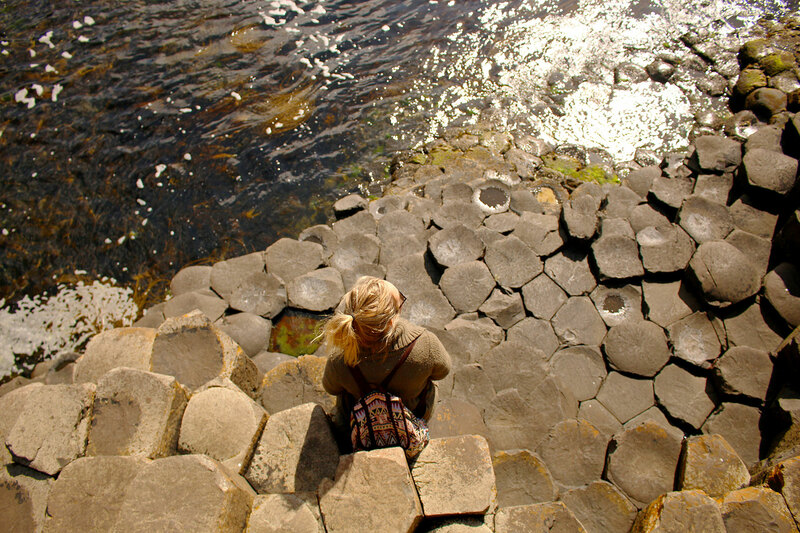 Tip: Pedestrian access to the Giant’s Causeway is free, as is the tourist information service in the Visitor Centre. If you use the parking area of the Visitor Centre you will be charged the visitor experience charge of £10.50. You may happen to find some free parking nearby otherwise you can park down at the Giant’s Causeway and Bushmills Railway station for £5 if you don’t want to pay for the visitor experience. There is a shuttle bus operated by Translink up and down to the stones for a fee if walking is too much for you. Why not take your chance to follow in the footsteps of giants? There are four different walking trails available for every ability. We highly recommend combining the trail to the Giant’s Causeway itself with the trail down to The Amphitheatre and back up The Shepherd’s Steps. Walking all around the top of the cliffs gives you a panoramic view of the Giant’s Causeway itself and the chance to take in the wider World Heritage Site, and the views are absolutely spectacular! Allow about an hour and a half for this whole route as it’s 3km in total. If you have the time to spare, why not walk the entire trail? It takes 2-3 days for a walker of average fitness to complete and links the towns of Ballycastle and Portstewart. Tip: Wear comfortable shoes, the Causeway stones can be slippy and The Shepherd’s Steps are steep. You can experience the Giant’s Causeway from a completely different vantage point with a boat trip along the Causeway Coast. 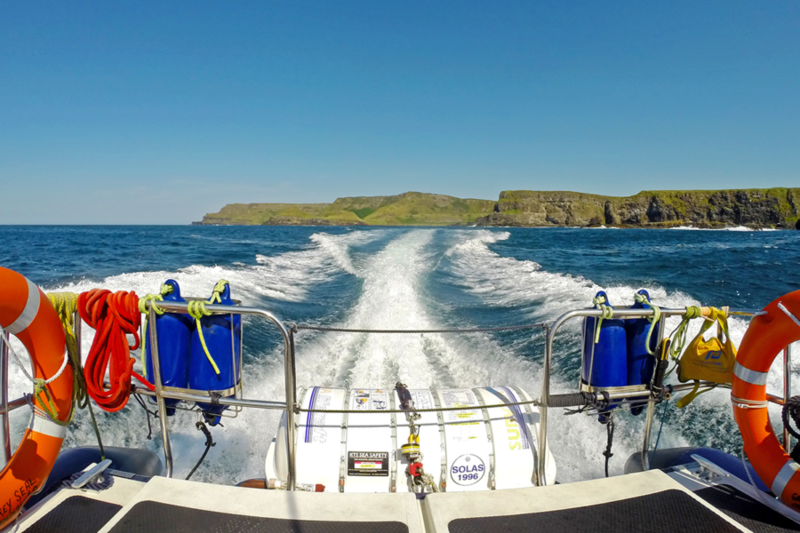 Portrush Sea Tours will take you by sea to the Giant’s Causeway from Portrush Harbour. On the way, you’ll also have the chance to see the Skerries, a group of small rocky islands, and Dunluce Castle from the water while Crawford the knowledgeable experienced skipper shares legends and folklore about the area and points out various birds and wildlife and shapes in the coastline. From the water, you really get a sense of the sheer size of the incredible limestone cliffs that line the Causeway Coast. Tip: Wear a jacket on the boat as it can be a little cooler offshore. 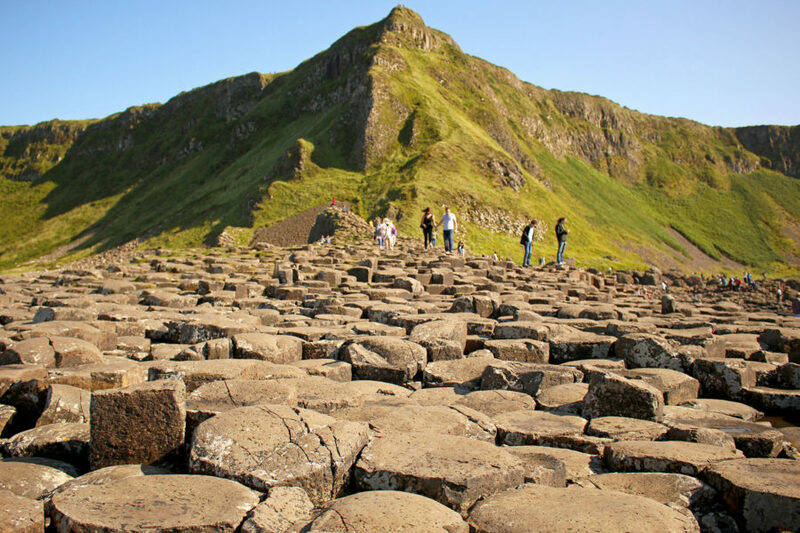 If you’re a fan of the HBO series Game of Thrones, then Northern Ireland and the Causeway Coastal Route will not disappoint, as there are loads of filming locations in the area. A short detour from the coast, one of Northern Ireland’s most iconic locations is the beautiful avenue of over 150 beech trees known as ‘The Dark Hedges’, located at Bregagh Road. Originally planted in the eighteenth century by the Stuart family to impress people as they approached their mansion, Gracehill House, the trees were used as the King’s Road in Season 2, Episode 1 of Game of Thrones. Even if you’re not a fan of the TV programme, the Dark Hedges are still a worthwhile place to visit as they are one of the most photographed natural phenomena in Northern Ireland – the spectacular light and shadow cast by the trees definitely make for a dramatic picture. If you visit at dusk, keep an eye out for the Grey Lady a lost spirit from a long-abandoned graveyard who is said to vanish from sight when she passes the last tree. This is a favourite local ghost story. Tip: Visit very early or late in the evening to avoid the crowds and be prepared to wait for that perfect shot. Park at the nearby Hedges Hotel and walk back to the avenue in two minutes. As of October 2017, cars have been banned on the road to protect the trees from damage due to the high volume of traffic that has passed through it in recent years. Be careful after stormy weather as the trees are almost 250 years old and prone to having rotten branches. Perilously perched on the cliffs of the Causeway Coast, Dunluce Castle is one of the most spectacularly located castles in Northern Ireland. The earliest written record of the castle is from 1513 and it is steeped in legend, with stories of a banshee and the castle kitchens falling into the sea one stormy night in 1639. 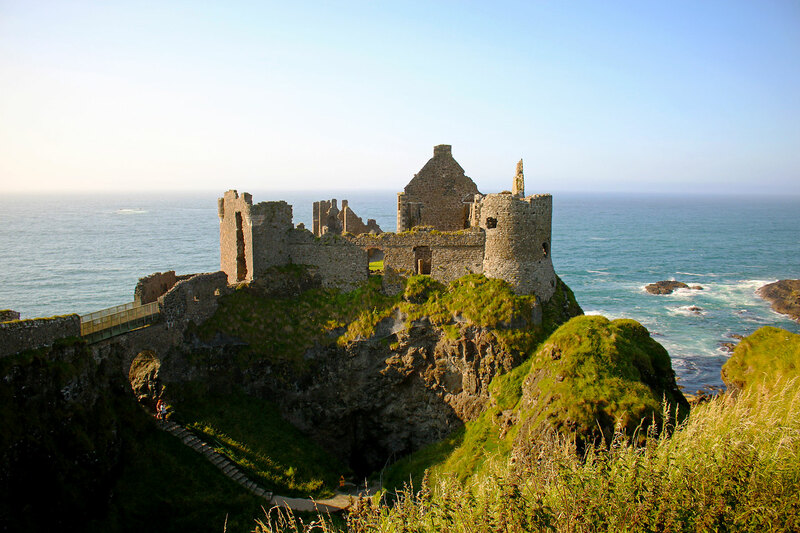 Travel back in time to the 17th century when you explore the excavated cobblestone streets of Dunluce town. Dunluce castle is also featured in Game of Thrones as the House of Greyjoy. Tip: The castle is open to visitors every day from 10 am with the last admission at 4:30 pm and 3:30 pm during December and January. There are some areas you can explore freely too. 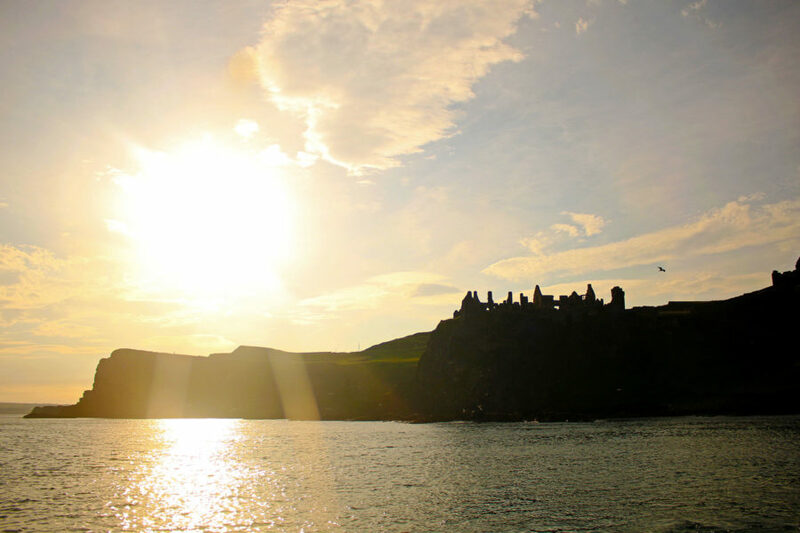 Download the free Dunluce Castle app for Apple phones for a virtual tour. This tiny, picturesque harbour is nestled at the end of a steep, winding road just one kilometre from Ballintoy village with its whitewashed church, one of Ireland’s most photographed churches. 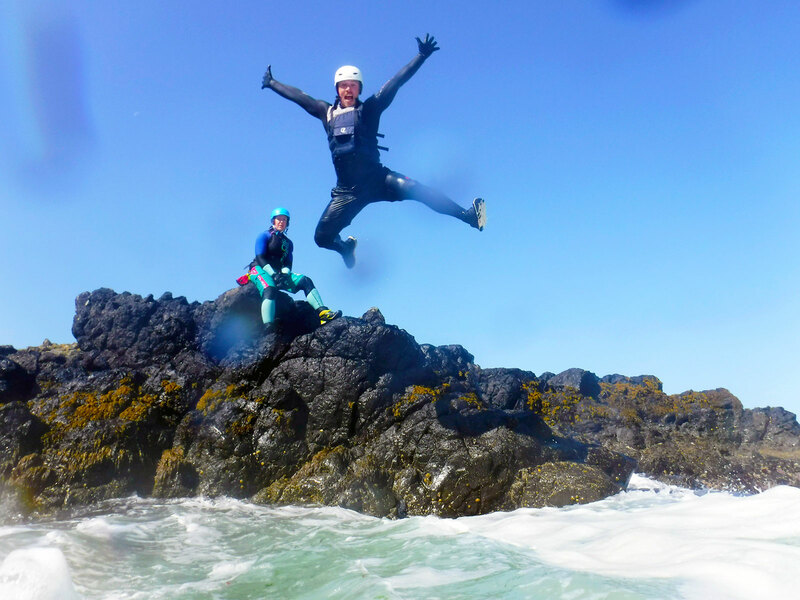 With secluded bays, rock pools and coves, here you have the opportunity to get your adrenaline pumping and experience the Causeway coastline in a whole new way by trying out some coasteering with the friendly, experienced team at Coasteering NI. 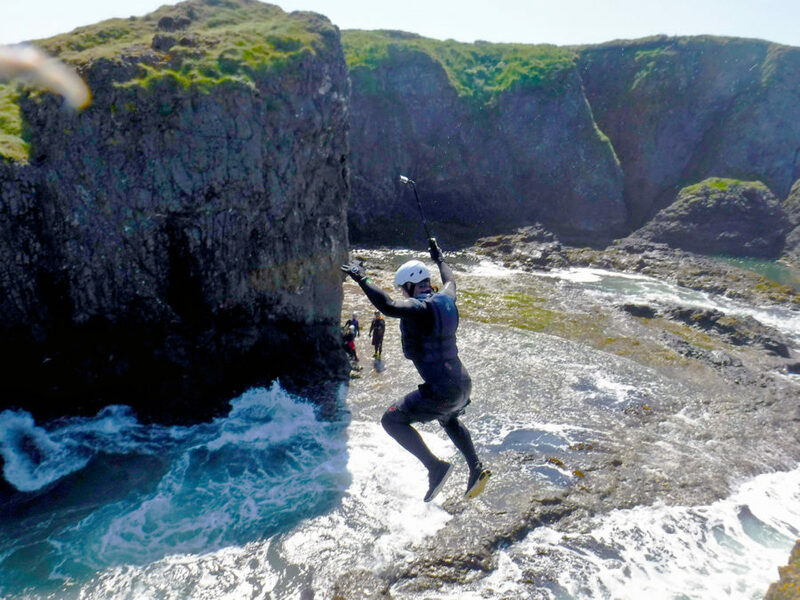 You might be distracted from the 50ft jumps off sea stacks by beautiful Ballintoy Harbour beach, which is among some of the most beautiful beaches in Northern Ireland. Game of Thrones fans will recognise Ballintoy Harbour too as it was used as a location in Season 2 and Season 6 of the HBO show. You may even get to meet one of the extras if Bobby is your coasteering guide. 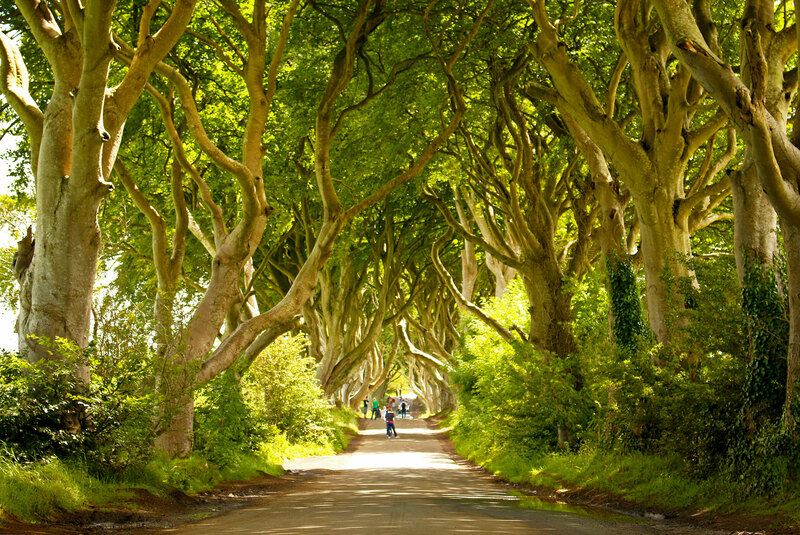 Tip: For more Game of Thrones filming locations in Northern Ireland check out this guide. There’s also a free app available for both Android and Apple. Northern Ireland is home to some incredibly stunning beaches so you should definitely make sure to add a few to your Causeway Coastal Route itinerary. One of the most natural coastline sites in Northern Ireland, you’d be forgiven for thinking you’d been transported somewhere tropical with Whitepark Bay’s spectacular white sand arced beach. The bay has been under the care of the National Trust as a place of historic interest and natural beauty since 1938 and with your first glimpse of it, you’ll see why. At almost one and a half miles long, you can definitely get a good stretch of the legs on this beach. At the western end, lies the small picture-perfect harbour of Portbradden which is home to St. Gobban’s Church, one of the smallest in Ireland. You can reach Ballintoy Harbour on the east side of Whitepark Bay at low tides but this adds on another mile. Tip: Watch out for cows and sheep that are known to hang out on the beach. Portstewart Strand is yet another beautiful stretch of Northern Ireland coast and is home to some of Ireland’s tallest sand dunes. Managed by the National Trust, the beach holds a Blue Flag award and is one of the few remaining beaches in Ireland where cars can still drive onto the beach. There’s the option for more beach walking here too, and you can explore the Barmouth nature reserve for a chance to spot some of the local wildlife and birds that nest in the dunes. Unusually enough for Ireland, there’s the chance to dine right on the sand in the award-winning Harry’s Shack. The funky, laidback vibe here makes it the perfect place to grab a bite of fresh, locally caught fish after a long day exploring. And the best part is you can watch the sunset right from your table! 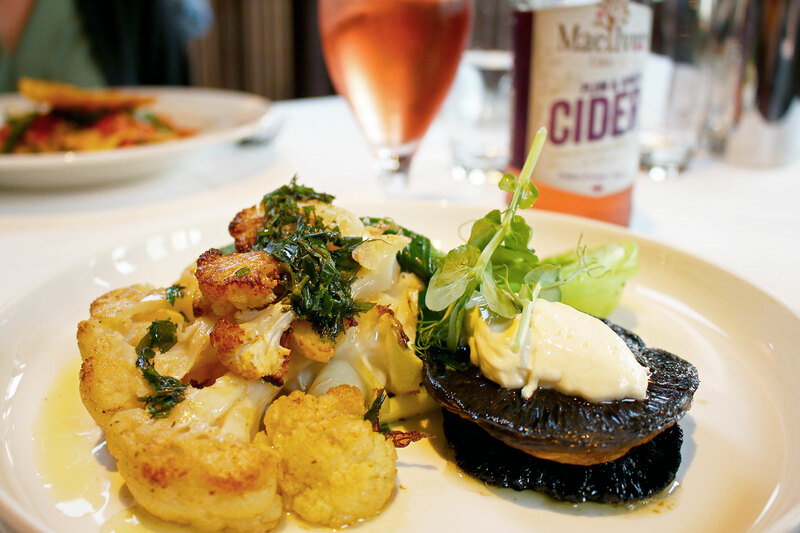 Tip: Be sure to book a table in advance here as it’s very popular. If the weather is bad, why not hop into the water and get wet. If the weather is good then even better! 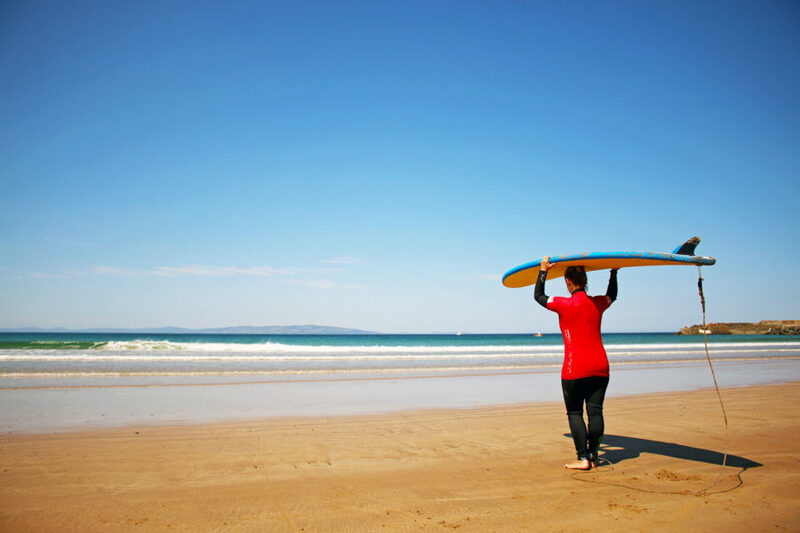 If you’ve always wanted to try out surfing or bodyboarding then West Strand, Portrush is the perfect place to give it a go and make a splash with a lesson. The Blue Flag beach is patrolled by lifeguards and you’ll be in safe hands with the guys at Portrush Surf School as the head instructor is eleven times Irish national bodyboard champion Martin “TK” Kelly. Tip: Watch out for the resident pod of porpoises just offshore. First erected by salmon fishermen in 1755, the Carrick-a-rede (pronounced locally as Carrick-a-reedy) rope bridge connects Carrick-a-rede Island to the mainland. Suspended 30m above the Atlantic Ocean the bridge is 20m wide and is open every day subject to weather conditions. 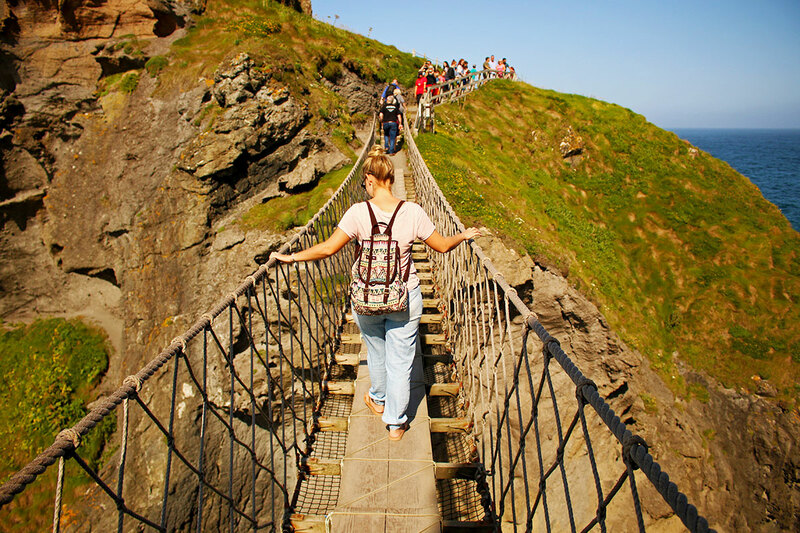 Although nowadays Carrick-a-rede rope bridge is much more sturdy than its humble beginnings, even still traversing the small swaying rope bridge is not for those with a serious fear of heights. Remember, you’ll have to cross back again too! If you can face your fears because the incredible views of the north Antrim coast from Carrick-a-rede Island are definitely not be missed. On a clear day, you can see Rathlin Island and even all the way across to Scotland. Absolutely incredible! 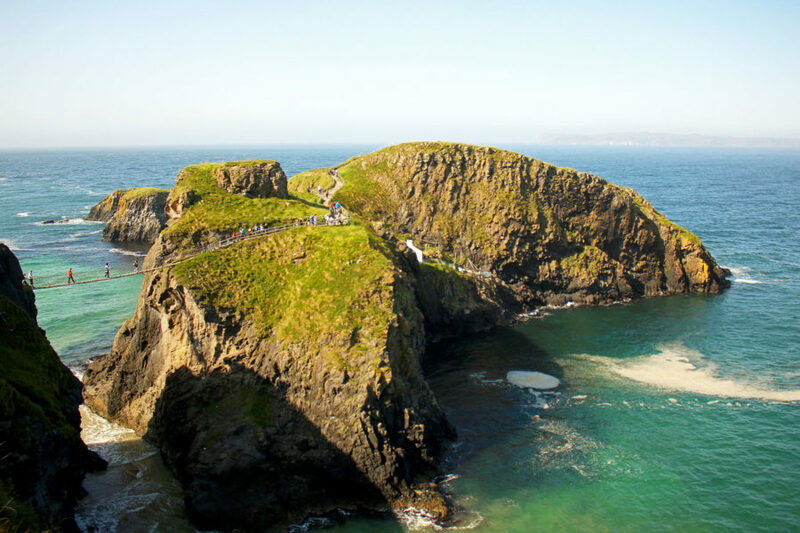 Tip: Carrick-a-rede rope bridge tickets are now timed since April 2017, so visit early in the morning to secure a ticket for the time slot you want on the day. The Carrick-a-rede rope bridge price for an adult is currently £7. 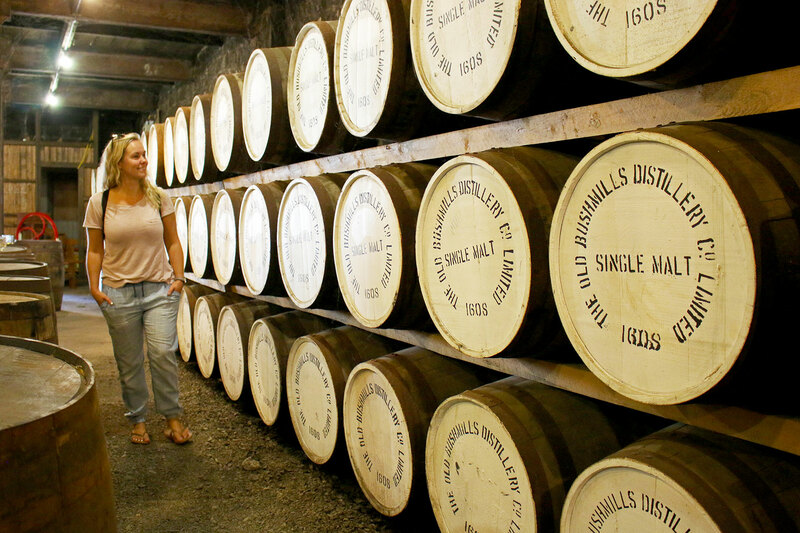 While it may be one of the most popular places to see in Northern Ireland for whiskey connoisseurs, and even for those who aren’t, you have to stop by at the world’s oldest whiskey distillery Old Bushmills Distillery. Not only is it home to the world’s oldest whiskey, but it’s also the only distillery in Ireland to make triple-distilled single malt Irish whiskey. This triple-distillation makes Bushmills whiskey uniquely smooth and rich. 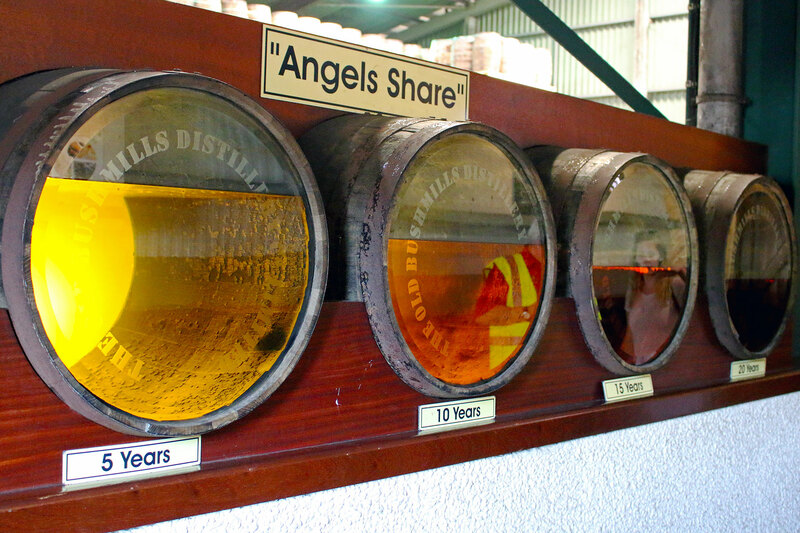 On the excellent guided Bushmills distillery tour, you can learn all about how Bushmills Irish Whiskey is crafted using traditional methods such as copper pot stills, how different flavours are added using different wooden barrels and about the angel’s share, an interesting phenomenon that occurs during the ageing process. There’s really a huge amount of work involved in the process. 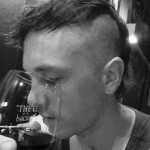 After the tour, you can do a tutored whiskey tasting experience in the 1608 Bar. We tried Bushmills Original, Bushmills Black Bush, Bushmills Single Malt 10 years aged and Bushmills Distillery reserve, a 12 Year Single Malt only available to taste and buy at the Distillery itself. Our whiskey expert also let us have a taste of the very rare Bushmills 21-year-old. We really couldn’t believe the subtle difference in flavours of each of the whiskeys and the smoothness that really got better with the age of the whiskey! Tip: The Bushmills restaurant in the 1608 Bar serves great lunches if you need some soakage after all that whiskey tasting! 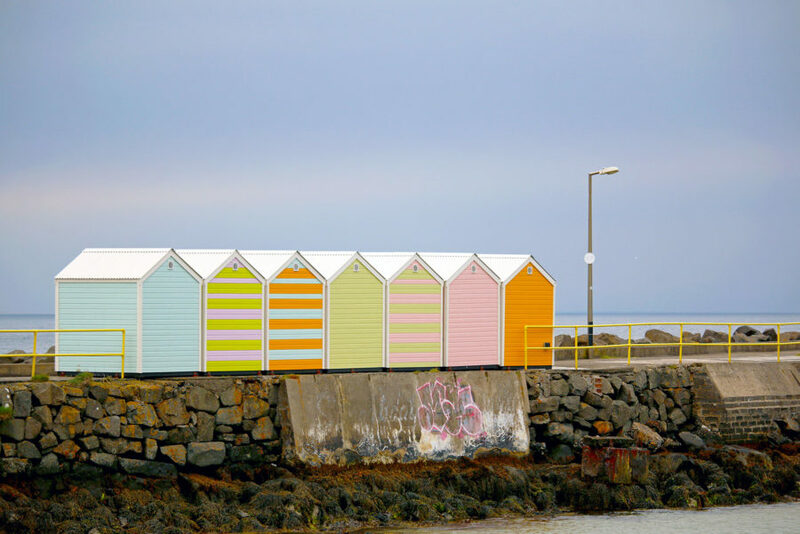 There are some lovely seaside and historic towns to base yourself in while exploring the Causeway Coast. These were some of our favourites. 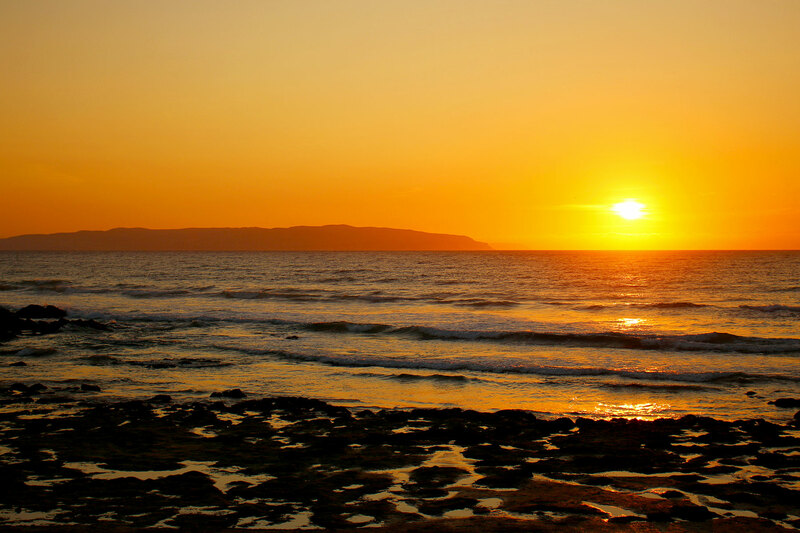 Portstewart was where we chose to base ourselves as it had incredible scenery, a beautiful long beach for evening sunset strolls and a laid-back vibe. We stayed in a fantastic 5-star bed and breakfast, At the Beach. The owner Glenda was extremely friendly and helpful and the little touches like coffee makers in the rooms made the place feel so homely. With direct access to Portstewart Strand, panoramic sea views, bright comfortable rooms, we thoroughly enjoyed our stay. We really couldn’t speak highly enough of the place. The best part was the unbelievable breakfasts overlooking the sea every morning. A choice of freshly cooked hot breakfasts was laid on as well as fresh fruit, cereals, a variety of bread, juices, tea and coffee. 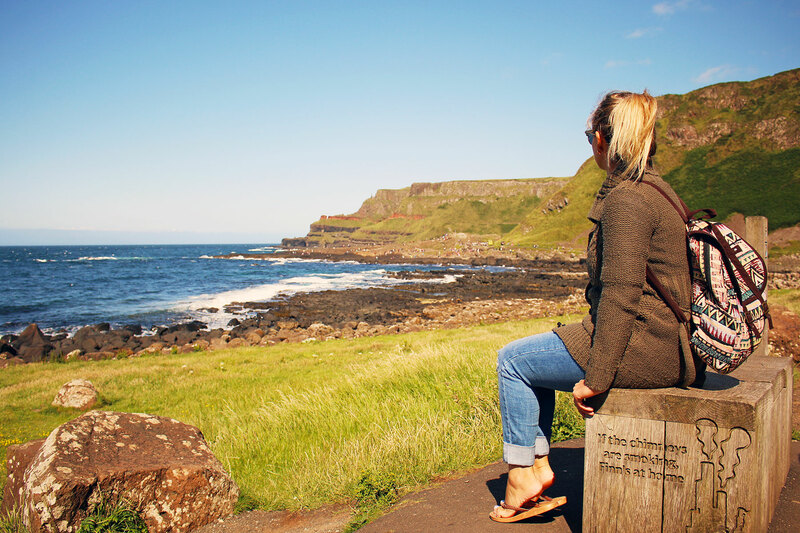 With long walks on the beach on our doorstep and a short driving time to all the major attractions, Portstewart really was the perfect base to explore the causeway coast from. 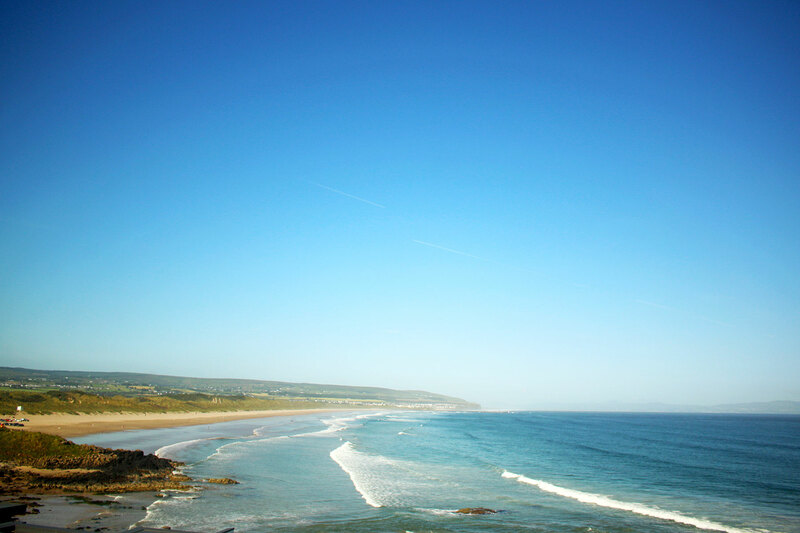 Check out more accommodation options in Portstewart here. Portrush is a lively seaside town, with three sandy beaches, a golf club and loads of fantastic bars and restaurants. It would be another option place to base yourself for your Causeway Coast itinerary as you’re on the road to all major attractions on the Causeway Coast. With excellent restaurants, you’ll be spoiled for choice eating out here. A few of our favourites were the Ramore Wine Bar, famous for their incredible desserts and located right on the harbour. 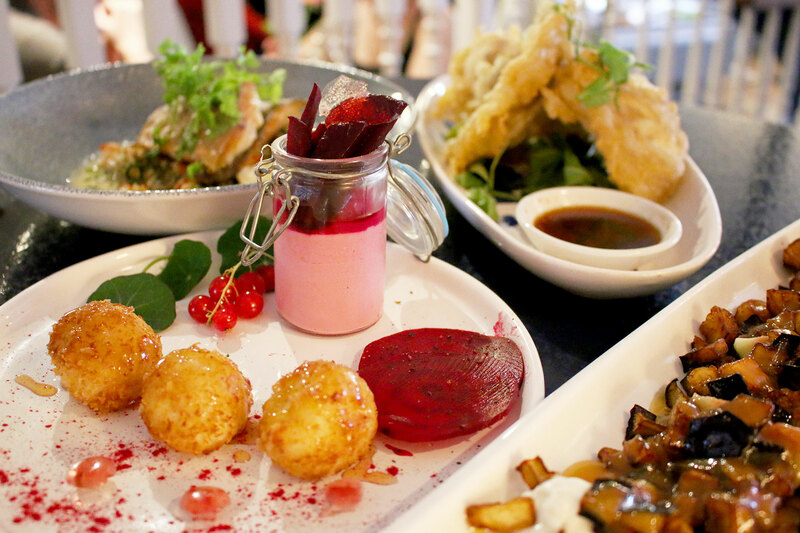 For an incredibly authentic taste of southern Spain in Northern Ireland head to Ocho Tapas. For your daily caffeine fix hit up Babushka Kitchen Café. 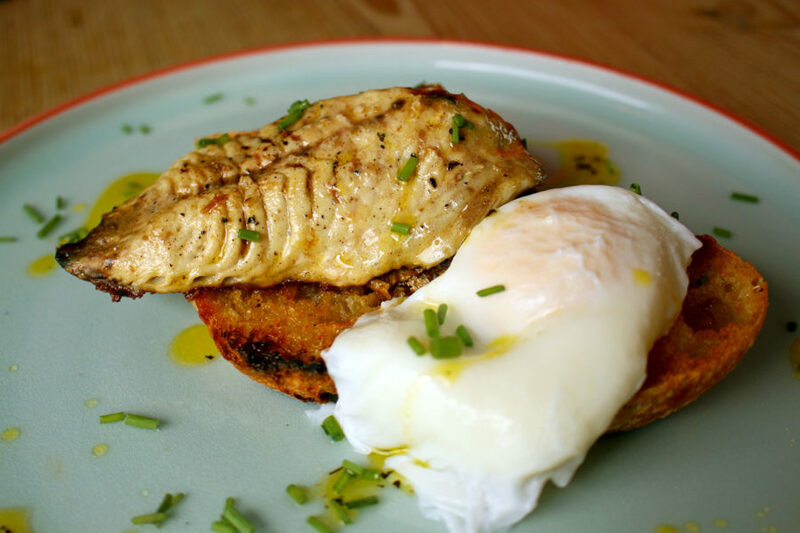 This funky little café has some amazing speciality coffee and even offers coffee tastings as well as fantastic brunches and lunches made using only the finest fresh locally sourced produce, all served up right next to the beach. Perfect! 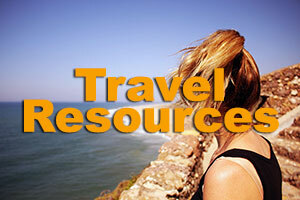 There are plenty of Portrush hotels to choose from, check out places to stay in Portrush here. 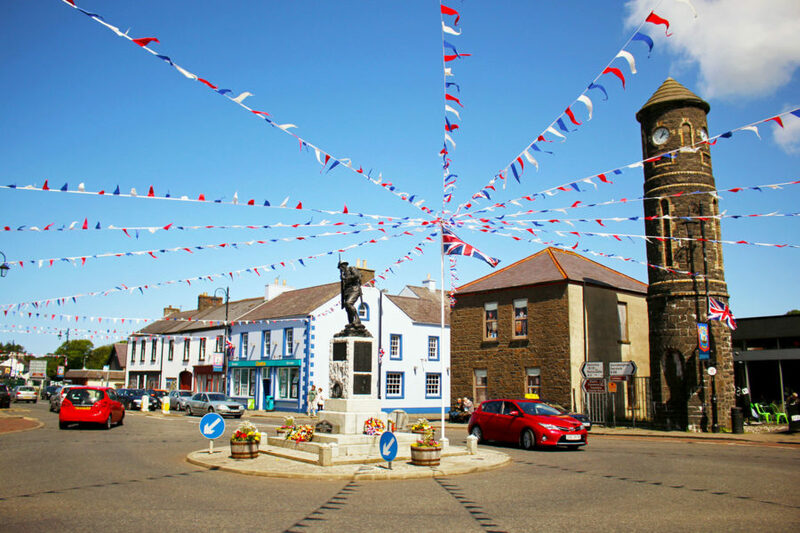 Being the closest town to the Giant’s Causeway at just two miles away, Bushmills village is a great place to base yourself. You can get to the Causeway by taking a trip on the Giant’s Causeway and Bushmills Railway which takes 15 minutes each way. Also home to the historic Bushmills distillery, this is a perfect place to base yourself if you plan on sampling a lot of Bushmills whiskey. 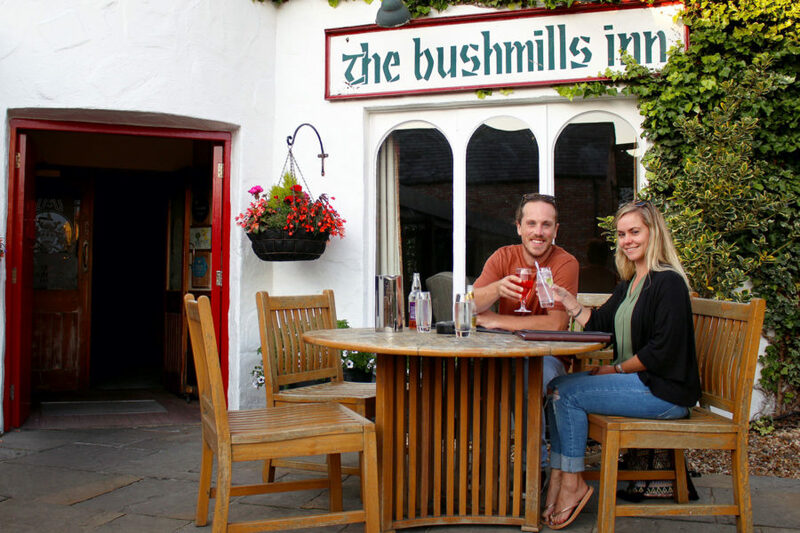 The best known Bushmills hotel is The Bushmills Inn. Now a lovingly restored 4-star boutique hotel and restaurant, it was originally a Coaching Inn and Mill House in the 1600s where visitors would stop to rest and sample the now legendary whiskey on their way to the Giant’s Causeway. With its turf lit fireplaces and small snugs, you’ll feel like you’ve been transported back in time. There’s even a private cinema. Book your stay at the award-winning Bushmills Inn here. If you don’t stay here definitely try to visit the restaurant and bar for a look around this iconic inn. 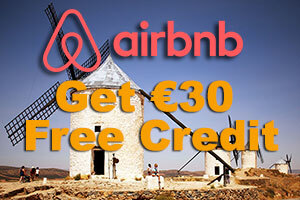 Check out more Bushmills accommodation options here. 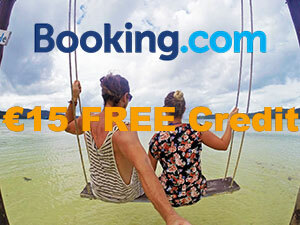 For the best deals on hotels in Northern Ireland, we love to use Booking.com, there are some fantastic options available in all of the areas listed above, depending on your budget – click here to find a hotel that suits your requirements and budget. There are also plenty of great offerings on Airbnb if you’re looking for somewhere more homely to stay on the Causeway Coast. With so many ways to experience this stunning stretch of Antrim coast, whether you walk, take the train or road trip, if you seek out Northern Ireland’s Game of Thrones locations, if you get active and out on the water, or if you simply hang out, relax and sample some amazing local food, you’re really spoiled for choice. 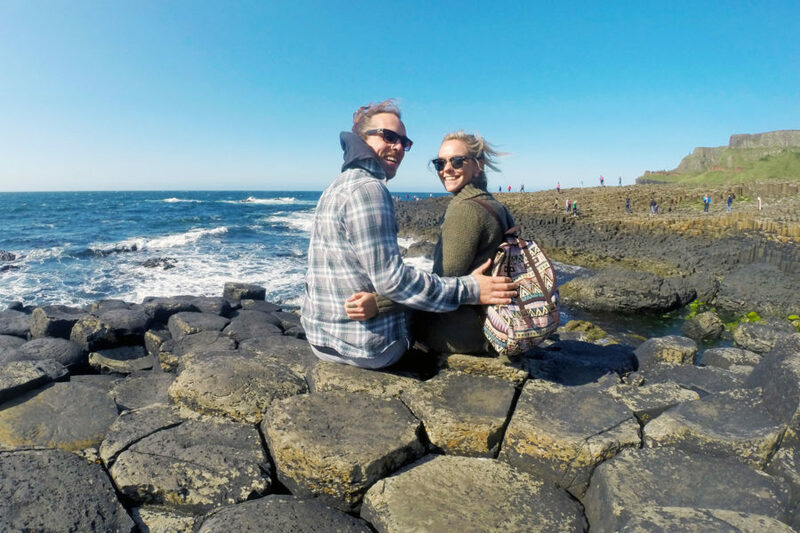 No matter what way you choose to experience the Giant’s Causeway Coastal Route, as it’s a designated Area of Outstanding Natural Beauty, one thing is certain, you’re guaranteed, like we were, to be more than impressed! 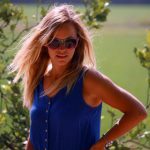 Noelle is a pescetarian foodie, travel junkie and a massive dog person. She's a self-diagnosed chocoholic and loves tea, coffee and red wine. She also loves to do yoga and therefore is the sensible, grounded one in the relationship! Noelle loves to really get to grips with the culture of a country and the mindset of the people. 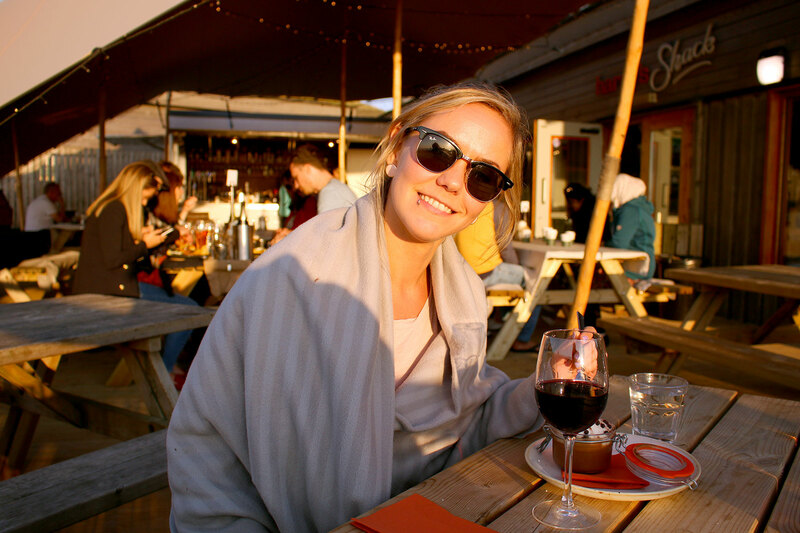 She also enjoys picking up a few words in the local language wherever she is and, of course, sampling the local food! That looks amazing! It’s so awe-inspiring to see what nature can come up with. I’ll be sure to go to the Giant’s Causeway sometime soon. Thanks for sharing your tips! No problem Sander, it’s definitely one for the bucket list! The Giant’s Causeway is amazing and the perfect example of just how beautiful and unique Ireland is as a travel destination! Love the blog guys 🙂 if you ever come to Ireland again give us a shout we would love to work with you! I would so love to do this trip with my family- minus the jumping off the cliffs into the sea (that must have been freezing!). What was your most favorite part? I agree with you this is a must-do road trip, also departing from Dublin. The Giant’s Causeway is amazing!! 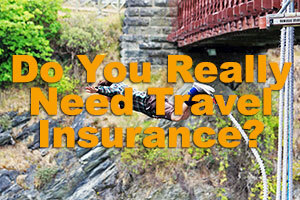 I see it mentioned on every travel program on Netflix. Your pictures really captured its beauty. I need to check this off of my bucketlist. Great post! “Try Ireland’s Older Whiskey,….” Yes! Absolutely Yes!! 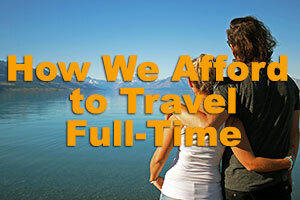 Great article, would love to visit. Haha! 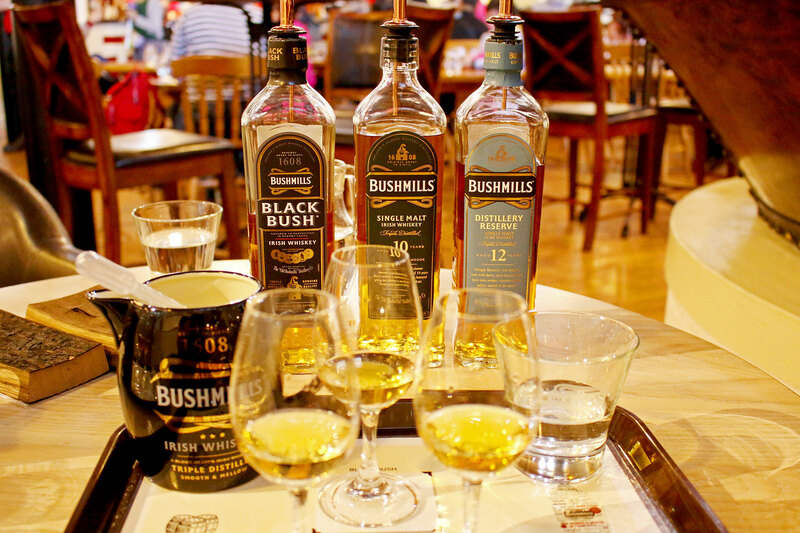 Ya, we loved trying the Bushmills too – so good! 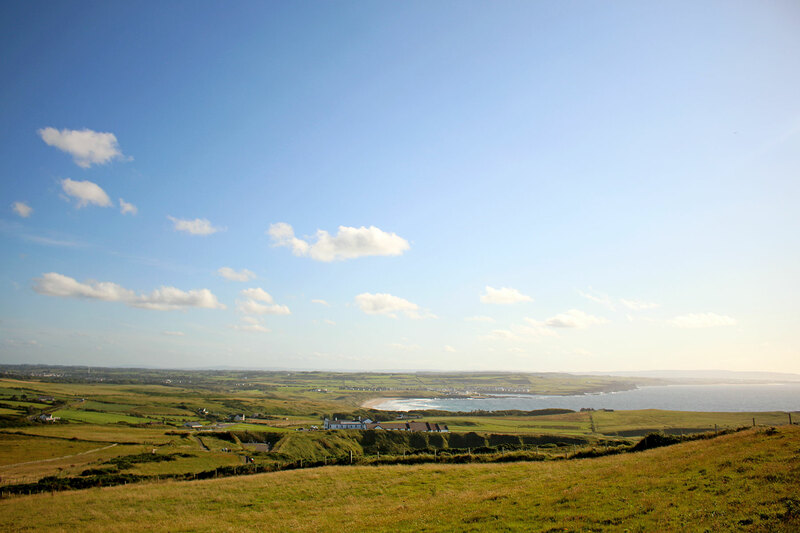 We highly recommend the Causeway Coast – such a beautiful part of the country.